TiECON Chennai is the annual flagship event of the Chennai chapter of The Indus Entrepreneurs. Conducted towards the end of every calendar year, it aims to provide a platform for all stakeholders of the entrepreneurial ecosystem to network and work together in creating a healthy business environment. TiECON annually sees a footfall of 1000+ people, an audience comprising of aspiring entrepreneurs, established business leaders, venture capitalists, angel investors as well as members of the public closely involved with entrepreneurial activities. Following the success of last year’s conference themed on ‘Believe.Build. 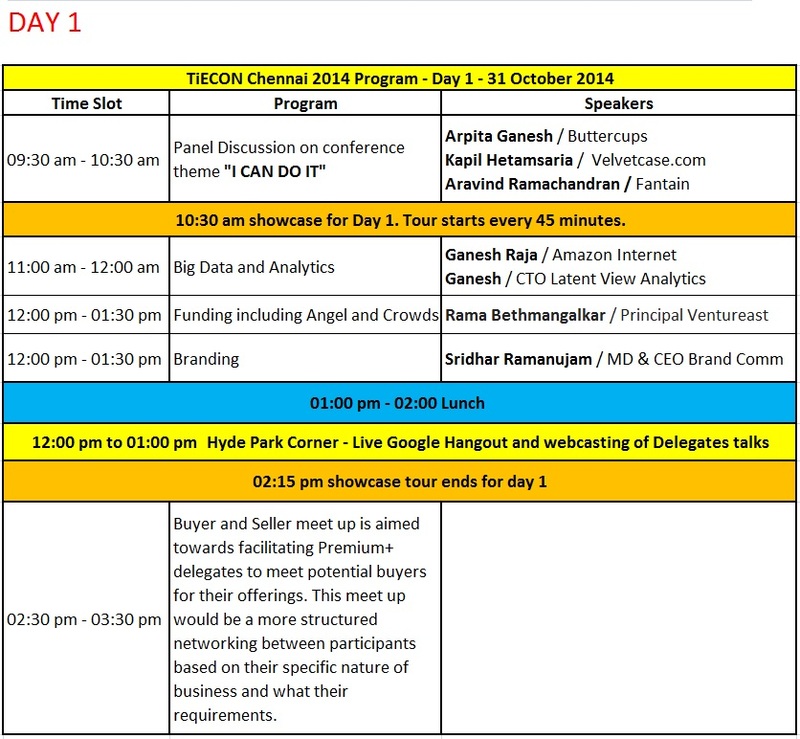 Become’, TiECON Chennai 2014 is scheduled as a two-day event on October 31st and November 1st, 2014 and is centred around the theme ‘I Can Do It’. Day 1 of the conference will be centred around two major events. > TiECON is proud to introduce the concept of Showcase to India where leading companies will walk pre-registered delegates through scenarios related to funding, scaling, hiring and marketing. This opportunity to hear it directly from success stories themselves (both technical and non-technical firms alike) is surely a once in a lifetime chance! > Master Classes will also be conducted with the help of external resource persons and will look to explain the intricacies and complexities that every entrepreneur faces when dealing with subjects such as funding, branding and Big Data. This event also requires prior registration. Other experiences on offer over the two days include Hyde Park Corner where delegates will have the opportunity to connect with members of the entrepreneurial ecosystem around the world via Google Hangouts as well as our specialized mobile application which acts as a one-stop answer to all TiECON Chennai related queries. TiECON Chennai 2014 is all set to be a two day extravaganza, boasting of the who’s who of the entrepreneurial circuit coming together and contributing to an atmosphere of learning, networking and mutual exchange. Block your calendars. Be there.